The League of Women Voters of Hilton Head Island-Bluffton asked local elected officials on Saturday to support an independent state redistricting commission. 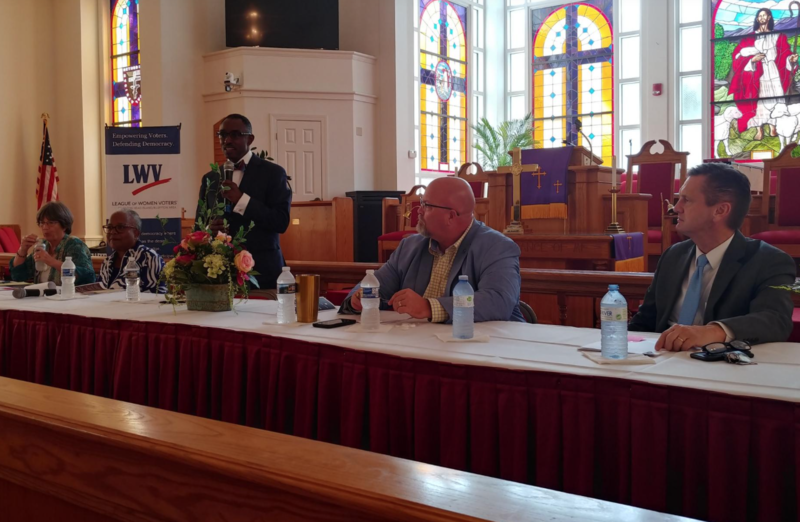 Chairwoman MaryAnn Bromley told state Sen. Tom Davis and Beaufort County Councilman Mike Covert, the only two officials who attended a legislative discussion panel at Campbell Chapel AME Church, that creating an apolitical redistricting commission is the League's "primary concern." "We are not partisan. We don't care who is gerrymandering. We don't want it," Bromley said. Last week, the U.S. Supreme Court heard testimony on two separate cases involving accusations of partisan gerrymandering: one by Republicans in North Carolina and the other by Democrats in Maryland. The court has yet to make rulings on the cases, but Bromley cited national media reports that some justices, including Brett Kavanaugh and Neil Gorsuch, believe individual states should mandate oversight to prevent gerrymandering. "We don't know what the Supreme Court is going to rule, but we have a pretty good sense that the Supreme Court is looking for the states to do something," Bromley said. Davis said he supports the idea and introduced Senate Bill 135 in January. It would lay the groundwork for an independent commission and require members of the General Assembly to reference the commission in its redistricting sessions. The bill is currently in committee hearings. "Ultimately, as members of the General Assembly, we've got to pass and agree to the districts," Davis said. "That's our statutory and constitutional obligation. "But in terms of the recommendations and deference, I'm all for independent commissions and laypersons and communities getting together and deciding what those divisions should look like and then submitting them to us. "And unless there is an overwhelming reason (otherwise), we should have to adopt those." South Carolina voting districts are re-examined every 10 years. The last redistricting went into effect in 2011 and another is upcoming in 2021.Davis condemned gerrymandering and said he found the practice to be prevalent ahead of the 2011 redistricting. "The important thing is to separate politicians from the process," he said. "I was amazed at the amount of incumbent protection that's involved in the process, both Democrats and Republicans. "The primary objective for any politician — and I think this is across the board — is to get re-elected. They're very well in tune with who lives in their district, where people of like-mind reside and whether or not you get as many of those in your district as possible is a material factor in drawing those lines." A news release from the League of Women Voters said the organization's goal is to eliminate those practices. "The next redistricting process occurs in 2021 but we must start working on the process now to ensure that the redistricting process puts voters first and not politicians," the release stated. "We don't seek an advantage for one party or the other, but a fair deal for voters. With our current system, S.C. Senate and House members pick winners and losers by the way that they draw the lines for voting districts for the U.S. Congressional House of Representatives as well as S.C. General Assembly House and Senate districts." Covert, who plans to run for U.S. House District 1 as a Republican in 2020, said he supports Davis' bill and the League's efforts. He went on to quote a section of the release that "says it all," he told the forum: "Voters should pick their representatives; representatives should not pick their voters."